Here’s my guilty secret – prior to moving to Asia I had no interest in travelling in Asia. None. At all. To me, Asia was a place you transitted in on your way to other places. My husband being offered a job in Asia is, I believe, the universe sending me a message to put aside my judgements and go with the flow! And I am extraordinarily glad to have the opportunity to travel in Asia and Cambodia was the first ‘must do’ on our Asian travel list. It was only when we were in Cambodia that I asked my husband if Cambodia was where the Australian man David Wilson was kidnapped and executed in the mid-90’s. I have a hazy recollection of thinking only completely crazy people would travel to such a country. I guess that makes me completely crazy. In Siem Reap we stayed at the Siddharta Hotel. It was lovely and we had two adjoining rooms (BIG adjoining rooms) for $99 a night. This also included breakfast, a massage each, one dinner/lunch, a tuk tuk with driver and a Playstation in the kid’s bedroom. As our girls have minimal electronic gadgets so they thought this was heaven. The hotel is very clean and stylish, the staff are friendly and there’s a gorgeous salt water pool. As it was low season less than 1/5 of the rooms were occupied. My only niggle was that it was tricky to get the hot water going and the house next door (I believe it belongs to the governor of Siem Reap) has a little dog that barks all night. And I mean ALL NIGHT. Yap, yap, yap, yap. 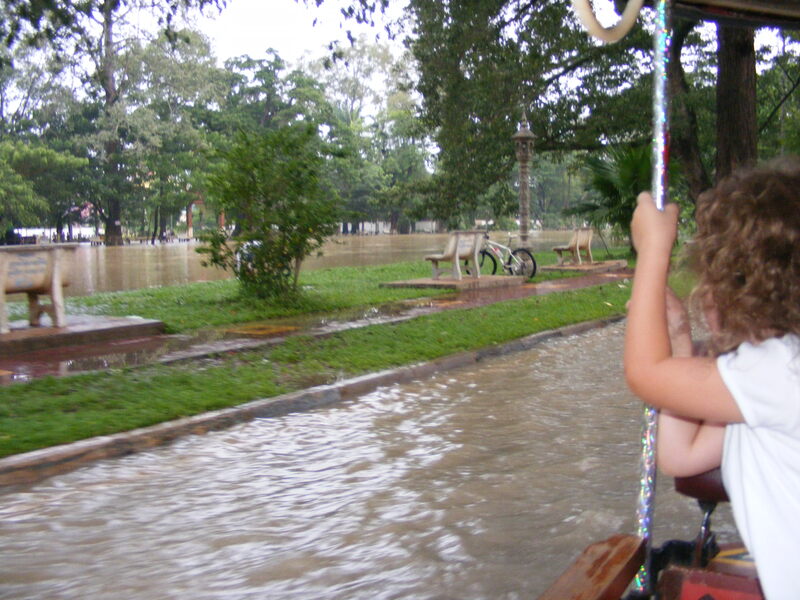 The hotel is mid-way between Pub Street and Angkor Wat, so it’s not where the action is, but that suited us fine and was quite fortuitous as the river and the surrounding area was badly flooded. The people of Cambodia are a delight. Not once during our weeks stay did we witness any Cambodians angry or frustrated or annoyed. They seem so happy and I can only contribute this to the traumatic history of their recent past. Little irritations must seem so insignificant when until recently you lived in a strife-torn country. The temples around Siem Reap are amazing. Astonishing. Astounding. But temple fatigue sets in quickly so, if you possibly can, space out your temple-hopping. Seeing more than two in a day could leave you dizzy. Also, try and visit temples when they are the least busy, your driver or guide should be able to advise you on this. Arriving at a site the same time as 4 tour buses will hamper your enjoyment. Our guide got us to Ta Prhom just past 8am when it was at its quietest and it certainly added to our visit. Cambodian food is delicious. I highly recommend the lok lak and the amok. The airports at Siem Reap and Phnom Penh were a surprise – clean, modern and efficient! I was expecting something similar to what we experienced in Harare, which was little more than a tin shed. Phnom Penh doesn’t have a heap of touristy things to do, and several aren’t suitable for the Missies so we stayed in the Sofitel and left the girls in the Kids Club. 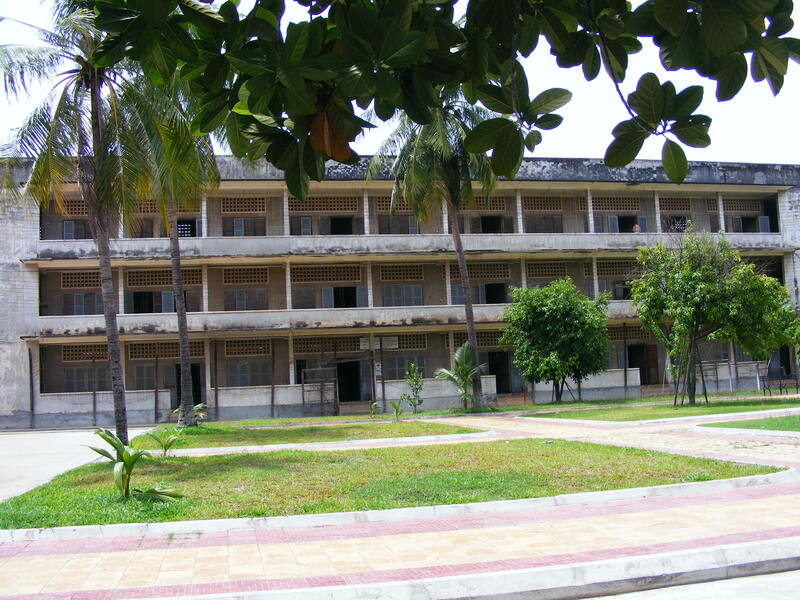 We went to the Tuol Sleng Genocide museum (better known as S-21), and my husband went to the Killing Fields the next day on his own. I found the museum upsetting, but I’m glad I went. It’s a very raw museum, very graphic. There are blood splatters on the ceiling and floors and photographs of the dead bodies that were in the rooms after the Khmer Rouge fled. My girls favourite place in Phnom Penh was undoubtably The Russian Market, and seeing it on The Amazing Race a few days before we left gave it added interest. It has most of the usual knick-knacks you find throughout Asia, but it had a great ‘vibe’. 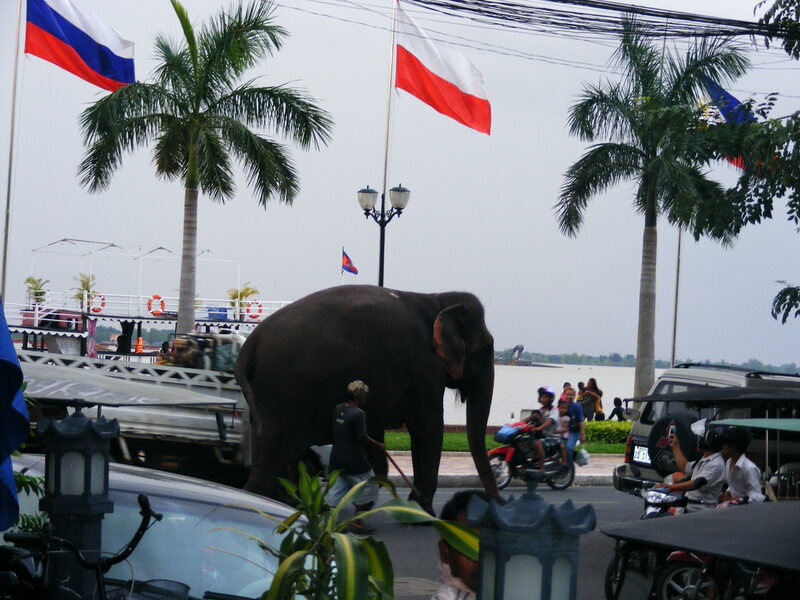 We also loved having dinner at Sisowath Quay and watching people (and elephants) pass up and down the street. We are very keen to return to Cambodia, particularly to the south. Thanks for this. I love hearing about others holiday experiences in different places. Sounds great! I love Asia , always have. I love a bit of third world country adventure. Having lived in Phnom Penh for more than 3 years now (we are Kiwis) I am always interested at what people new to Cambodias charms think. It is actually a very easy country to live in expat wise although the corruption and the hard nosed one upmanship of Cambodians to each other does get to you a bit if you let it. Glad you enjoyed your visit. I really enjoyed Lok Lak. We were told that it was really the only true Cambodian dish. And we loved the Russian Market! I got my favorite piece of luggage there – a great carry on with the name of “Samsnite”. 🙂 So glad you enjoyed your time in Cambodia. We’d love to go Siem Riep. We’ll get there soon. You really, really must get to Siem Reap before your time in this part of the world is up! Apart from the temples there is lots of other stuff to do and see. We had a stop at the Landmine Museum – which is also a school/orphange for land mine victims – and it was really interesting and a good antidote for temple fatigue. the people of Cambodia sound amazing…..I really hope to visit one day. Enjoyed this post. 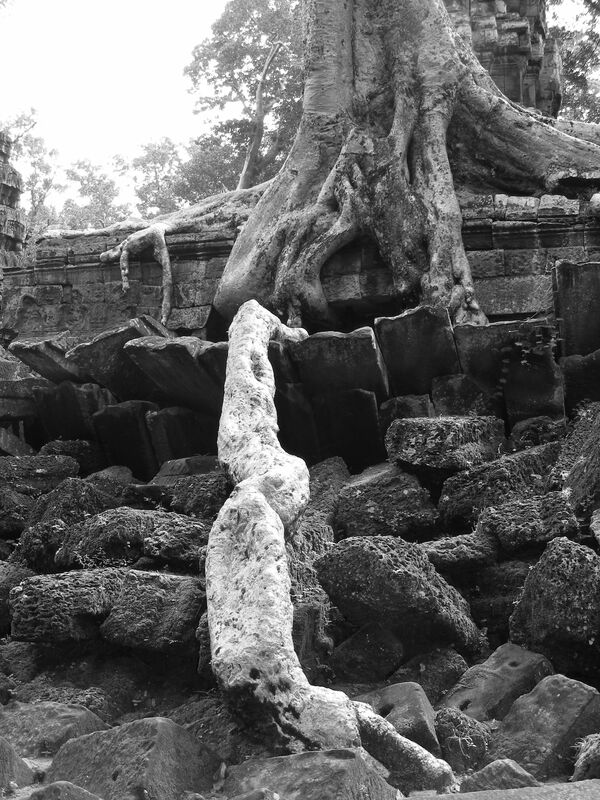 And if I do go I will watch out for temple fatigue…think I will probably only want to see Angkor Wat as I heard so much about it in history class.